Pit Stop USA is The Online Motorsports Superstore! QTM Brakes is a manufacturer/distributor of QTM brake systems for open wheel race cars including Sprint Cars and Midgets. QTM Brakes offers Sprint Car Brake Kits, Brake Calipers, Brake Rotors, Brake Caliper Mounts, Sintered Brake Pads and more. QTM brake calipers feature aluminum alloy for both pistons and caliper body. This allows for dimensional stability through thermal cycle. Unlike stainless piston and aluminum caliper combinations, internal tolerances are maintained at all temps. Hard coating of pistons and bores not only resists corrosion, it significantly reduces wear. QTM brake calipers are engineered to reduce caliper flex at high line pressures, improving pedal feedback. 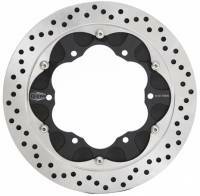 QTM 3-piece brake rotors have two QTM friction surfaces mated to an aluminum center core for low maintenance, great cooling, light weight and economy. Dyno test show an average of 400 degrees F cooler operating temperatures than iron rotors. Other benefits include lower unsprung weight and rotating weight. QTM’s standard blade rotors features proprietary friction surface that generates a higher coefficient of friction over traditional iron, aluminum, Ti or other rotors. This allows for a lighter brake package that generates more power with no brake fade. We feature QTM Brakes products at low everyday prices.